I regularly troll YouTube looking for covers of pop music, however when you search “cover + song title”, you inevitably end up with 100 acoustic covers done by anyone with a piano, guitar and a voice. Generally nothing too exciting, usually a slower version of the pop song. Side note – if you ARE looking for acoustic covers of pop songs done really well, check out Boyce Avenue, Madilyn Bailey, and Savannah Outen. 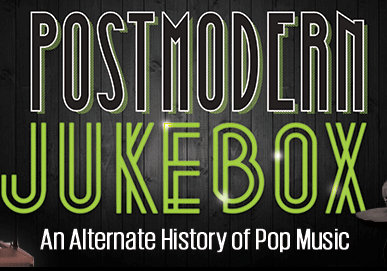 Anyway, when I stumbled onto Postmodern Jukebox, I knew I had struck gold. Pop songs with a vintage twist, they are such a unique cover band. Do you like Doo Wop? Ragtime? Swing? Ever wonder what pop songs would sound like if they were sung in speak-easies? Yeah, me neither, but now I can’t stop listening. Their doo-wop cover of “Timber” is pretty amazing as well. Grab their album on iTunes and listen on repeat!